This item has been discontinued by Mopar. Premium Tubular Side Steps for the Jeep Liberty are constructed of lightweight anodized aluminum. True Tubular Side Steps are mandrel bent to ensure the steps maintain a consistent diameter. 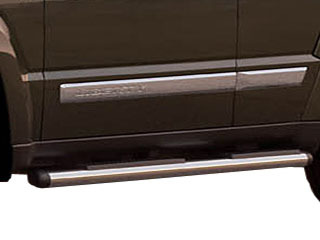 Premium Side Steps include molded end caps to accent your vehicles styling. 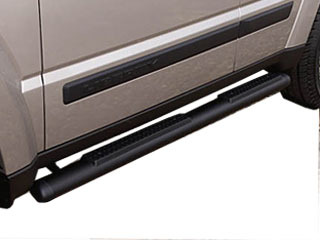 Side Steps provide wide skid-resistant stepping surfaces for easy vehicle entry and exit. Black Powder-coated or Chromed Aluminum Tubular Side Steps, Raised step pad with Jeep logo. Please select style above.